NVIDIA announced two new chipsets for Intel processors today. Where NVIDIA has only targeted the high-end of the Intel chipset market to this point, the new chipsets are aimed at the entire Intel chipset line. The new NVIDIA nForce4 SLI XE MCP is designed for the Performance Mainstream segment, while the new NVIDIA nForce4 Ultra MCP is aimed at the Mainstream market. Along with the existing nForce4 SLI x16 MCP, this chipset release means that NVIDIA has an almost complete top-to-bottom product range for all Intel Socket 775 processors. Motherboards based upon the new chipsets should be available in the retail channel within the next thirty days from several motherboard manufacturers. The best way to show the similarities and differences in the new chipsets, the continuing nForce4 SLI x16, and the "to-be-discontinued" nForce4 SLI, is to compare their features. 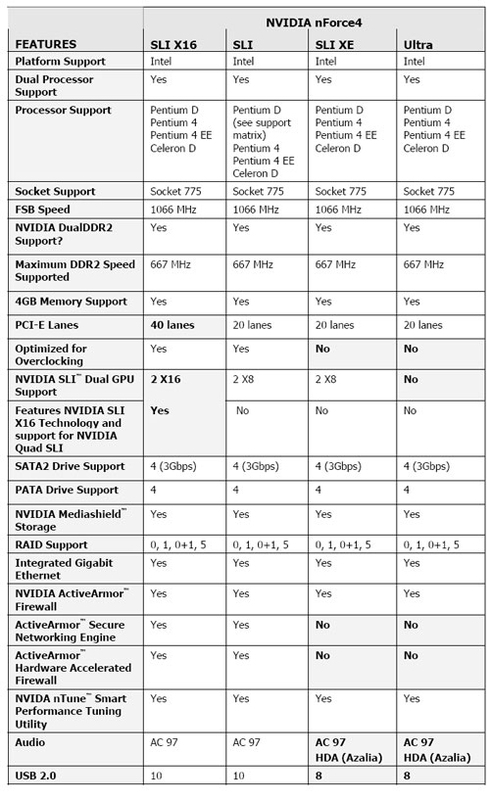 The below chart highlights the differences in the four chipsets. The expected price point for the existing nForce4 SLI x16 MCP will now start in the $150 US range and extend upwards depending upon options implemented on the boards. It appears the existing nForce4 SLI will eventually be phased out of the Intel line, since it has known problems with some Intel processors. These processor support issues were corrected in the nForce4 SLI x16 MCP. The new nForce4 SLI XE and nForce4 Ultra chipsets are also said by nVidia to fully support the full line of existing Intel processors. The nForce4 SLI X16 MCP also offers full support for the upcoming Quad SLI technology and is optimized for overclocking. Unlike the new nForce4 SLI XE and Ultra chipsets, the nForce4 SLI x16 will offer up to 10 USB ports along with full support for the ActiveArmor secure networking engine and hardware accelerated firewall. The nForce4 SLI x16 will continue to offer AC97 audio and not High Definition Audio. This is a particularly strange move, since the new nForce4 SLI XE and Ultra MCPs both support high-definition audio. It could be argued that the higher-end chipsets would more likely be used with a discrete audio card, but it appears that NVIDIA's plan is to introduce HD audio with new NVIDIA chipsets - leaving existing chipsets undisturbed. The XE lacks the broken firewall, but includes better audio. I am disappointed that review sites (yes, you) continue to advertise Nvidia's broken firewall as a feature but fail to actively investigate the problems that have been repeatedly reported. It doesn't sound like you have thoroughly tested the firewall, including downloading large files to various NCQ-enabled hard drives, or tried using the firewall after upgrading the drivers. If you have done any these things, you haven't reported them to us. I seriously doubt you have, as you would have encountered some type of problem by now. In addition to the internal testing Gary talked about, we also pressed nVidia hard to investigate the reported problems with the Firewall. We sent them a list of complaints in our Forums, and nVidia actually worked directly with a group of AT readers to try to duplicate the reported problems. A year ago i bought a MSI K8N NEO 2 Platinum, this motherboard, with a nvidia nForce 3 Ultra chipset, had problems from the very start. Just after installing Windows XP SP2 for first time, the system had BSOD problems with the nVidia embeded hardware firewall, I had to disable the firewall completelly to avoid these BSODs. Part of my setup was a SVGA BFG GFORCE 6800 ultra OC (Overclocked) and i had issues with constant pauses. The graphics would stop for 5~10 seconds every 3~5 seconds only for Direct 3D games. I had issues with the nVidia Serial Ata drivers and i had use the Windows ones to avoid BSODs too. Yes, i know this was a nForce 3 and a lot of time has passed since i built my rig, but as time passes i don't see any real advance in stability for the entire nForce series of nVidia chipsets. Much, much time passed before nVidia launched a new nForce 3 unified driver after the 5.10 one and the issues was not corrected too in the last one. This latest driver for nForce 3 gave installation issues too. Sorry, but with this situation i have lost any confidence with nVidia and their products. I just completely rebuilt my PC over the holidays, and yes it is a completely fresh install of Windows XP SP2 with no p2p software installed. The latest Nvidia drivers were used from the start, integrated into the Windows install using nLite. The motherboard is an Asus A8N32-SLI Deluxe. The only apps installed are SpeedFan, CPU-Z (which aren't really "installed" in the Windows sense), FEAR, and AVG. I have experienced download corruption in large files saved to both my Seagate 7200.7 and Samsung SATA2 drives, using various SATA ports. There are two ways to resolve it. The first is to disable the Nvidia firewall completely. The second is to set the default behaviour for the firewall to "not offloadable". Once again, this second option is essentially disabling the advertised "built-in hardware accellerated" feature. Prior to my A8N32-SLI, I had the A8N-SLI Deluxe, and I was never able to upgrade the drivers without having NAM start causing BSOD's within seconds. I uninstalled previous drivers, and yes even used Driver Cleaner. The only p2p software I used then was Kazaa Lite, and it was hardly ever running. I have not tried slipstreaming the drivers into the XP load. However, I did load a clean image, the 6.72 platform drivers, 81.98 video drivers, and your applications (AVG was the free version 7). I ran the same downloads only this time with FireFox 1.5 and did not experience any corruptions on either a Maxtor or WD SATA drive. In fact, I transferred the same files across my network through another machine with the Nvidia Firewall and still did not have issues. Please email me your firewall settings. I downloaded 16 programs consisting of 700gbs of data last night with IE and did not have a corruption error on the Asus A8N-SLI Premium. I will run the tests tonight with FireFox 1.5. We have thoroughly tested the NVIDIA firewall options with our test suite. We have only had issues in our test beds (BSOD with NVTCP.SYS) after upgrading the drivers without first uninstalling the previous driver set. We have downloaded files from 300mbs to 3.5gbs to our Maxtor and WD NCQ-enable drives without an issue when utilizing a clean XP install, our benchmark image, and the latest NVIDIA platform drivers. However, we have been able to replicate a couple of issues listed below in personal testing but only after loading a combination of programs and driver sets. We will see if NVIDIA has any further comments and report back. Are you using a p2p program for file transfers and the NVIDIA SW-IDE drivers? If so, I can understand if you are having issues especially with BitTorrent at this time. This combination and others like it (µTorrent/Limewire) seem to create memory leaks that eventually lead to a BSOD condition or file corruptions (Firefox downloads are iffy also but not IE). We have also found that these same p2p programs create issues with other firewall programs, games, and applications like StarDock's Object Desktop software suite.